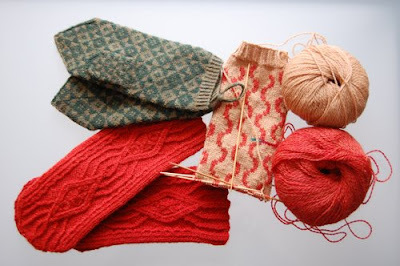 What I'm supposed to be doing: Clockwise from top: sewing the ends in Helgi's mittens (aka. Nana's birthday present this year, and I'd better get moving since the party is in a couple of hours;) finishing that first Wurst mitten; sewing the ends in and writing up the pattern to Bavarois. 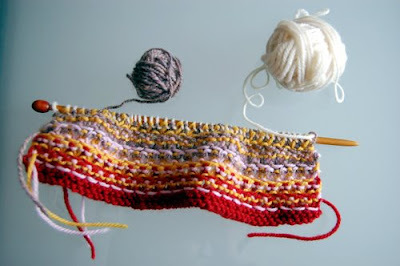 What I'm doing instead: Knitting a large, random swatch that I am going to abuse in several interesting ways until it does what I want it to do (and I'm still not quite sure what that is, but I'm fairly sure it will be some sort of bag, case or pouch.) The results will be liberally applied to my Etsy shop. This is serendipity at its finest! Now I have to go sew ends in. Fun. It's always like that, whenever there is something you actually HAVE to do, it's the last thing you WANT to do. Hooray for Nana! January 17, 2009 at 4:45 p.m. I must know: what is that lovely mitten in the upper left of the image? The one that looks like squares stacked perfectly, it's greenish, or bluey-green... It's so pretty! January 17, 2009 at 11:21 p.m.
Love the Wurst mitten(s). Can't wait for the pattern!!! January 18, 2009 at 8:21 a.m.
Adriana: Yes, Nana loved the mittens. As a knitter herself, she appreciates these kinds of things. DragonsChest: The pattern is Helgi's Mittens by Nancy Bush from Folk Knitting in Estonia. Glad you like them! Purlgirl918: Thanks! Wurst will be out as soon as I finish knitting the test mitten! January 18, 2009 at 3:13 p.m.